2017 has been the quietest year I’ve had since I started playing this music ten years ago. 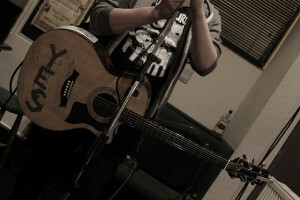 I think I’ve only managed to get the courage to play 3 gigs in the whole year, but they were pretty good. My last one, in October at the Hug and Pint, was as a duo with Gareth backing me up on electric guitar. That was a lot of fun, and part of the journey for me to work out what the hell I’m trying to do now. Throughout 2016 and 2017, I’ve written a lot of new material to follow-up on 2015′s Rise Again album. Yet, I’m now at around 98 songs on my 8 track and an album hasn’t formed together, so something has gone wrong. Intrinsically. For every time I thought I had a route I wanted to go down (and there’s a lot of sounds and genres on the 8-track), I reached an internal crisis of confidence, trust, and outright fleeting hatred of everything I had created before and was trying to create now. It was a disaster. My disaster. Which brings us to The Dr D Disaster. Rather than trying to create a new album or EP that fits the sounds of my earlier Dave Hughes stuff, I’ve decided to just release the raw stuff from the 8-Track as and when I feel like it. Its not that I think these songs are bad, far from it, it’s just I can’t fit them to an album that’s consistent enough. The first EP came out a couple of weeks ago, and it felt pretty good to just release it without any fanfare or expectation. These are two songs that kinda felt like they belonged on a raw dirty punk rock EP together. the next EP will sound different again, and the next again will be different too, until I’m finished. My brother did some cracking artwork, and will hopefully continue to illustrate the series. There isn’t a new website, nor a new bandcamp (things will be released through the Different Circle Records bandcamp page), but there is a Facebook page you can get updates through. There will be some gigs here and there in the coming year, I don’t know what form they’ll take yet, it might be acoustic, it might be full band (drummers, get in touch), or it might be a solo mandolin/bodhran/spoken-word disaster, who knows. I hope you enjoy the next part of the journey, and thank you very much for following me this far. I’ve been looking for a way to mark 10 years of folk-punk music from myself and one of my ideas was to do a ‘Greatest Hits’ LP. The aim was to try to collect together a good sample of my songs and what it is that I do. The initial process of that (finding all the old master recordings, demo’s etc) became pretty arduous and very quickly the idea was shelved (although we did find some cool out-takes which might come out later). Instead, a new plan was hatched and a few months ago, I recorded a live album filled with most of the song choices that I had planned for the greatest hits, Finally, it is now ready for release. It features 11 of the hits, 2 brand new songs, and 1 cover of a Ryan Adams song. It was recorded live in front of a lovely small intimate audience in a flat in Ibrox, Glasgow, July 2016. Recorded and Mixed by Different Circle’s Gareth McNicol. Influential and legendary folk-punk songwriter, and friend, Erik Petersen (of Mischief Brew) sadly passed away days before they were due to start their long-awaited EU/UK tour. There are many great articles appearing about his life and work. I was asked to write about what Erik meant to me over on the London Celtic Folk blog. My heart goes out to Denise, Mischief Brew, the Pugs, and the Petersen family. 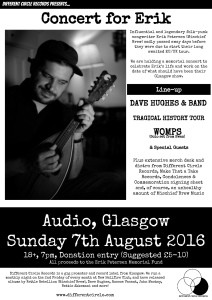 We are holding a memorial concert to celebrate Erik’s life and work on the date of what should have been their Glasgow show. 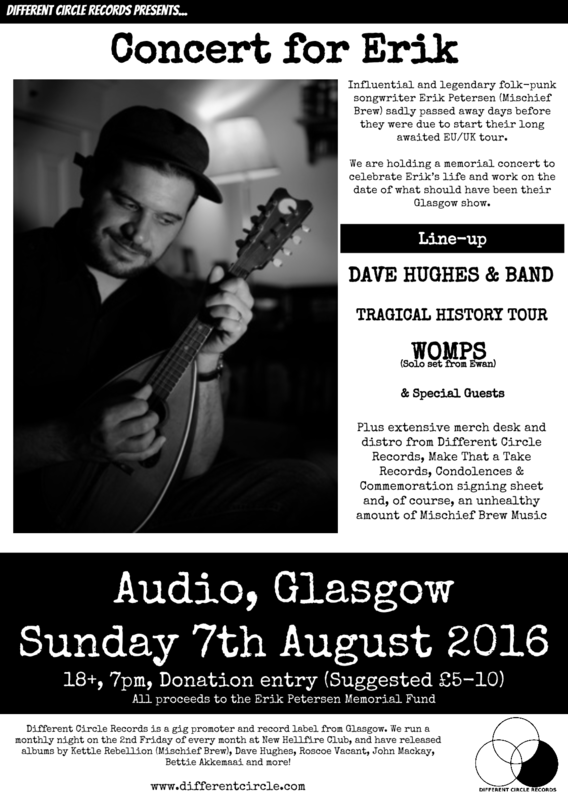 All proceeds to Erik Petersen Memorial Fund, and we have organised a great line-up of myself (with a brand new folk band), Tragical History Tour, and WOMPS (Ewan Solo). 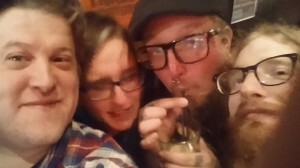 If it wasn’t for Fistolo (the label that Erik and Denise ran to release Mischief Brew records), there wouldn’t be our own home, Different Circle Records. They were an inspiration on how to run the label (along with Make That A Take Records), and we were lucky to work with Erik and Denise on releasing a CD version of the proto-Mischief Brew “Kettle Rebellion” LP. After having one of the shittiest weeks imaginable, Monday evening took me some way along the path of feeling better about myself. But first, a bit of back story. I first met Janine and Jessica in Edinburgh in 2014 when I was playing a show with Oxygen Thief and Mark McCabe. I had received a lovely email from them, telling me how much they loved my music and could they come along to the show, and perhaps meet me afterwards. I don’t get those kind of emails that often, so naturally I obliged. 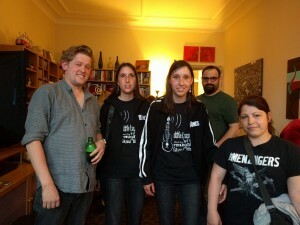 The following year, i travelled through Germany to Aulendorf to play a show for them at Bar IrReal. Each time they have shown massive levels of support for what I do, re-instilling my faith in the connection that writing songs can produce. Last week, I received another email from Janine and Jessica telling me that they would be in Scotland for a punk rock show that was happening over the weekend. They had noticed that I didn’t have any gigs organised that coincided with their trip, which was a shame as it would have been nice to catch up. To try to go a little towards repaying even a small part of everything that they have given me, I conspired with my right hand man, Gareth, to put together a special show for them. We decided on a small house concert on Monday night, at Lynne and Gareth’s, with the girls, their friend Julia, and some of my closest friends. I gave the girls the change to choose the set-list (which meant a lot of strange choices of old songs that I haven’t played for years, but such is their level of enthusiasm and knowledge of my full back catalogue). We had Zoe Graham as an opening act and she was brilliant, a complete natural performer despite her youth. I then played an hour of songs (old, new and a Ryan Adams cover), broke the fourth wall, and genuinely had one of the best shows that I’ve ever done. 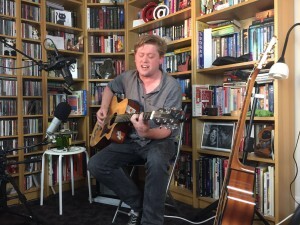 Gareth recorded and filmed the whole thing, and once it is mixed properly we hope to share it with you. A massive thanks to everyone that was involved in every way. I don’t know anymore if music can save your life, but it can definitely make the journey a bit more bearable. My new single “Emma” is released today. All proceeds will be going to St Columbas’ Hospice via Paul Sheils’ (Emma’s father) Celtic Challenge bike ride. You can buy the single from Bandcamp, iTunes, Google Play, Spotify, and all the other digital outlets. There is a launch show in Glasgow tonight at New Hellfire Club (Argyll St), from 7pm. 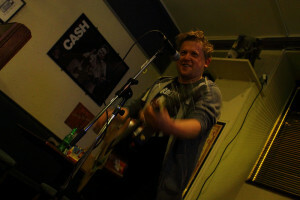 Roscoe Vacant and James ‘Bar’ Bowen are also playing, and its free entry with BYOB. Bar and myself will be heading through to Edinburgh tomorrow to play at Woodland Creatures. That’s an early show, starting at 3pm and all done by 5pm. The fundraising single for St Columba’s Hospice is released tomorrow, but I thought I’d give you a sneak preview of the track 24 hours early! I’m sending a huge amount of thanks to everyone who has pre-ordered the EP from Bandcamp. Together, we’re raising a bunch of cash for a charity that supports people when they need it most. Without much further ado, here’s the studio version, enjoy and turn it up loud! The Pay-What-You-Want pre-order is open now for the fundraising “Emma” single, with all proceeds going to St Columbas’ Hospice. The single itself will be released on 11th of March through all digital stores. If you pre-order/buy through bandcamp you will get a very special B-side which I recorded at the weekend with a small band. Here’s the video for the B-side. It was recorded live at Gareth’s house, with a band comprising of Roscoe Vacant on piano, John MacKay on Fiddle and the RFPB’s Dan Irving on Bass. It’s a nice compliment to the studio version, which is all big electric guitars and drums! 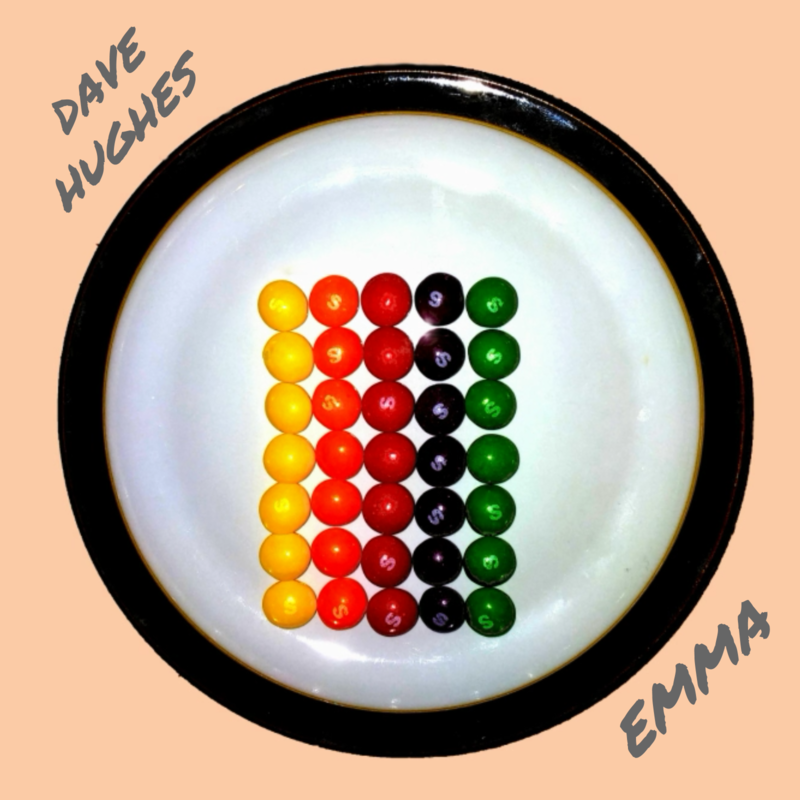 Friday 11th March sees the release of “Emma”, a fundraising charity single by Dave Hughes for the St Columba’s Hospice through Different Circle Records (Glasgow). The song will be widely available, primarily from Bandcamp to increase charity revenue, but also via iTunes, Google Play, Spotify and the rest. The track is named in honour of his friend Emma Sheils who passed away in January 2016 after bravely fighting an aggressive brain tumour. As well as a close friend, she was also commonly seen as a photographer at concerts in and around Dundee and Edinburgh. Dave Hughes used one of her photos for the cover of last year’s “Rise, Again” album. St Columba’s Hospice in Edinburgh were fantastic in making Emma as comfortable as possible in her passing days. Her father, Paul Sheils, is undertaking a charity bike ride from Edinburgh to Iona as part of the Celtic Challenge. 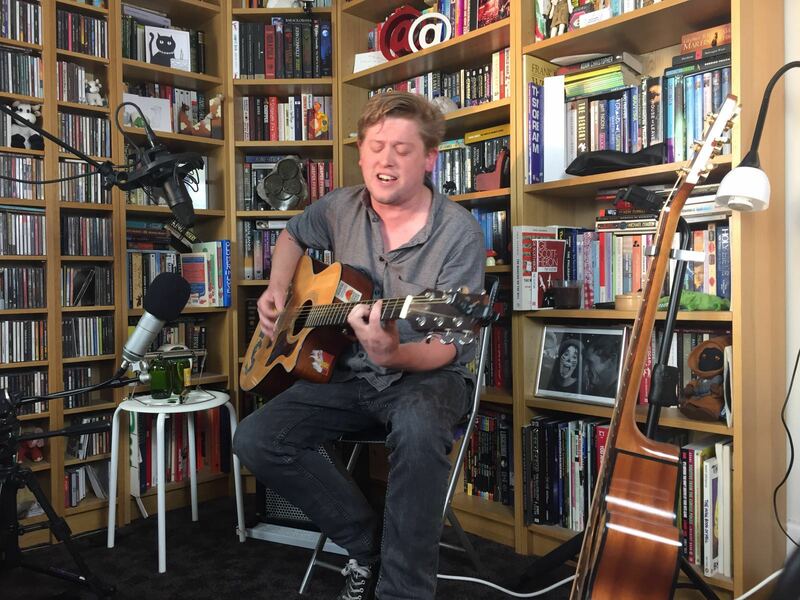 Proceeds from the ‘Emma’ single will go towards his fundraising total. A launch event will be held on Friday 11th of March at New Hellfire Club in Glasgow. Also appearing will be Roscoe Vacant and James Bar Bowen. Entry will be by donation to the charity, and a raffle will be held through the night to pick cover songs for Dave Hughes’ set list. One of Emma’s hobbies was photography and when she’d come to my shows, she’d normally have her trusty SLR with her. She had a real knack for capturing the fun aspect of my shows, and I have used her photographs for posters and CDs. In particular, the front cover of the ‘Rise, Again!” album comes from a photo that she took of me at a show in Cerberus. On the day that the world found out that it has lost Alan Rickman, I received a call to tell me that Emma had passed away. We worked in the same building in Dundee, and when things were going really bad for me, she’d be part of my small group of close friends who would take me for a coffee or a beer after work. Cerberus, a photography by Emma, complete with my bad hair. One day I mentioned that someone had passed me a YouTube link of “some guy” called Malcolm Tucker which I found hilarious. The next day, Emma arrived at my desk with every episode of the Thick of It (plus the film) so that I could get up to speed with the rest of the world. To say that I’m going to miss her would be an understatement. The RFPB with Emma. This is the only photo I can find of myself and her. Testament to her usually being the photographer and not the subject. O’Hireath you’ve got me slipping asunder. The website has had a make-over to make it much more useful. I wanted to make a simple site that would act as a hub for everything related to what I do with my music in the coming years. I’ve got a few things in the works, mainly writing the follow-up to Rise, Again (more songs, fewer instruments), playing a few shows around the place, and generally getting my house in order. I’ve always found that January is a good month for reflection, and this is no different. 2015 was a mixed bag for me, I think I released my best record with Rise, Again (Freedom of Something, is a song that I’m very proud of) but I do wish that I had managed to get more people to listen to it.